Everyone in Washington state will be affected by climate change. But one’s race, income, and language, influence how much risk Washington state residents and workers face from wildfires, floods, extreme heat, and other climate-related hazards. 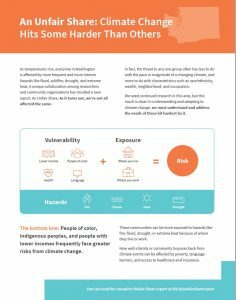 Communities of color, indigenous people, and people with lower incomes, are all at greater risk because we’re more exposed to hazards, where we live and where we work, and face greater barriers and often less power to respond. Those are key findings of a collaborative report created through a partnership between Front and Centered, and the University of Washington, with the support of the Seattle Foundation. The report describes the potential health impacts of climate change and explores a range of factors, such as race/ethnicity, income, language and health status, that result in greater vulnerability for Washington communities. Front and Centered held community listening sessions across the state, where community members described their experiences and concerns about climate change and environmental pollution to inform this project. Our hope is the report will spark new research on climate and equity to fill key knowledge gaps, such as the costs associated with climate impacts on communities of color. We hope it can support community-based efforts, like Front and Centered, to develop solutions and increase resilience for people on the frontlines. 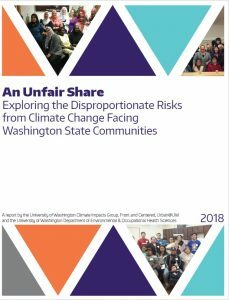 The report is a collaboration with the University of Washington’s Climate Impacts Group, Urban@UW, and the University of Washington’s Department of Environmental & Occupational Health Sciences. It was made possible with support from Seattle Foundation, which recently launched its Climate Justice Impact Strategy to ensure that communities of color and low-income communities lead and shape efforts to reduce the disproportionate effects of climate change they experience.